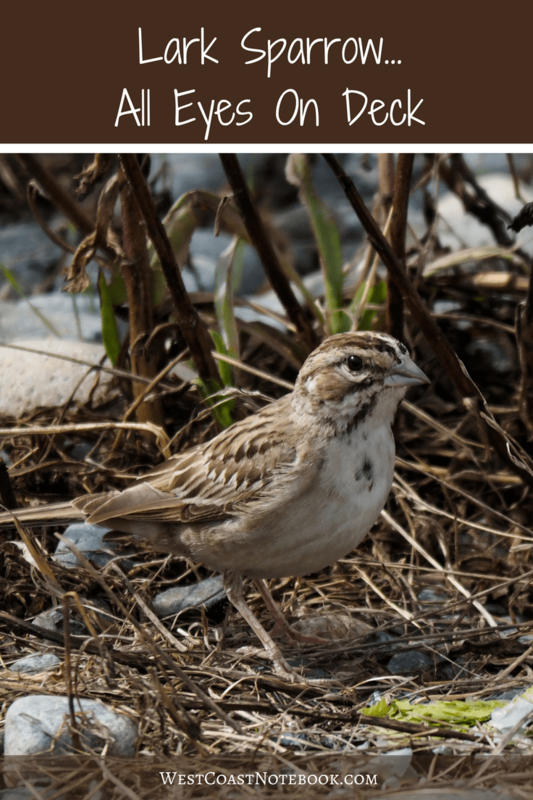 Yesterday I found an unusual bird in the shape of a Lark Sparrow. I went to Whiffin Spit which is one of my favourite haunts in the non-summer months. Summer has a tendency to bring out everyone and their dogs wanting to enjoy the beach and the birding suffers. Whiffin Spit was once a place where many a migrating bird stopped to rest its weary wings but over the years we’ve seen a decline in numbers due to the human and animal population especially in the summer months. Migrating birds like to stop, eat and rest before carrying on their journey south or north whichever way that may be and if they are constantly being disturbed, they will move on. But yesterday, the sun was out, the human population was at a minimum and most of the dogs were on a leash. It was a good day to bird! I headed down the spit wishing I had more eyes in my head. At this time of year, the shorebirds are migrating through, the ducks are returning, the raptors are on the move and who knows where might be lurking in the underbrush. I’m checking the ocean where I see my first surf scoters of the fall as well as watching the shoreline and the grass at the side of the path. Nothing too exciting except for the Savannah sparrows that have returned and are everywhere. The ocean has deposited mounds of seaweed on the shore and you can see them hopping in and about the brown mass. Thank heavens they have a very specific flight pattern so it’s easy to pick them out when they are flying. Otherwise, you would be spending all your day, trying to ID them. Checking along the shoreline there were some black turnstones which overwinter here and have just returned from their northern journey. And further along was one lonely western sandpiper sitting on the kelp. Now I’m getting to the part of the path where the trees start which added an extra dimension to the area that needed to be searched. They say if you take a walk down Whiffin Spit it should take about 30 minutes there and back if you are strolling. 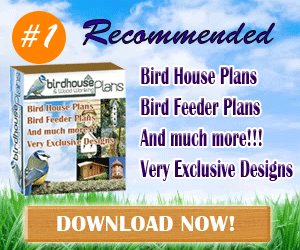 If you’re birding it might take 2 hours or more. Who knows what’s behind that bush or blade of grass? 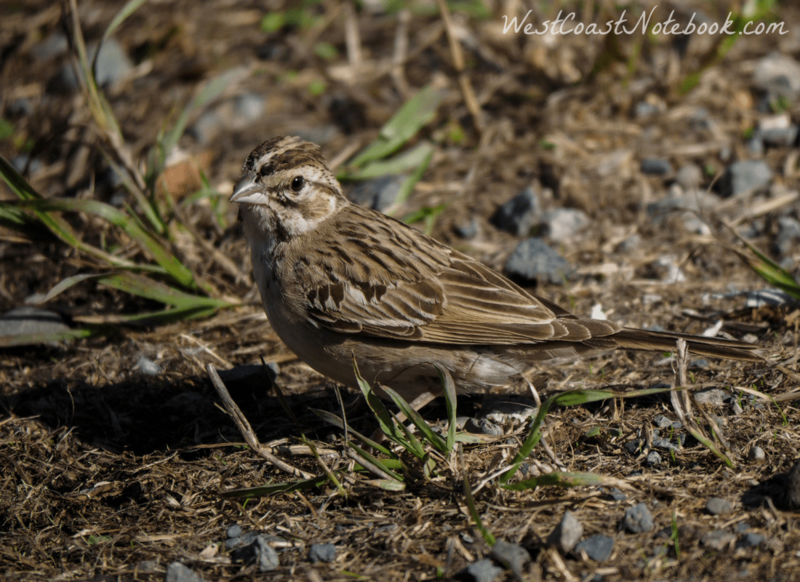 I made it down to the first field without spotting anything unusual and the field which is normally buzzing with white-crowned sparrows or at this time of year the Savannah sparrows was oddly quiet and still. Zigzagging through the field to see if there was anything hidden in the grass, all I ended up with was some grass seeds in my socks. Down the path again and onto the next field. Walking about 10 steps down to the water a burst of wings flew up and down the shoreline. Turns out I had almost steps on a western and least sandpiper. I caught up with them later down the field. Time to turn around and head back to the car and on the way I wandered through the first field again without any success. The same birds were along the shore and I didn’t see anything out of place in the trees. There are benches set out along the pathway for people to rest on and as I got closer to the parking lot, I had an urge to sit down on one. This was unusual as it’s just a hop, skip and a jump from the parking lot and normally I would just head for the car. But I was in an expansive mood and sat down to enjoy the scenery. Noticing some Savannah sparrow around the bench, I trained my lens on them to get a good shot and one of the birds looked a little different than the rest. It was in the grasses feeding on grass seeds and would pop its head out now and again. Finally, it came out into the open and I was able to get a good look at it and some pictures. I had no idea what it was, I just knew I had never seen one before. It wasn’t until I got home, found the bird book and checked out the sparrow that I thought it might be a Lark Sparrow. And sure enough, someone with a little more experience with them confirmed the sighting when I put the picture on a local birding board. The Lark Sparrow didn’t stay very long and soon it flew over the path down to the shore on the other side where I wasn’t able to locate it again. It is called a vagrant for this area of Victoria, BC, Canada which means it’s not expected annually, but has more than 5 records in the past century and it’s outside its normal range. Because I had put it up on the birding board when I got home, there was another notice that at 7:30 it had been spotted again in the same area that I had seen it by 6 people that had come out from Victoria just to specifically see it. 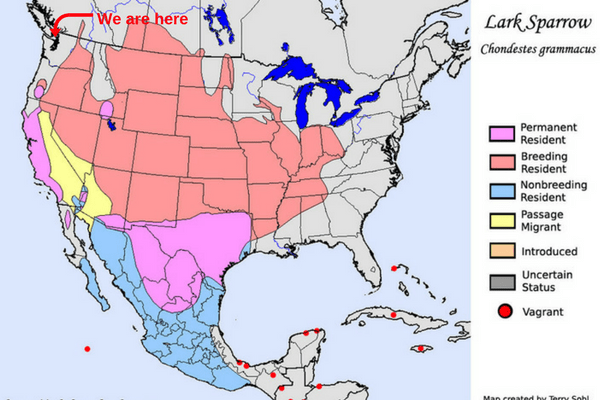 I tell you… if it’s something rare the birders will be there. The bird was in non-breeding plumage which is a little duller than when it’s all gussied up for the mating season. If you want to see what it looks like at that time, click here and you can see its very distinctive facial markings. This one had a very greyish white breast with one spot on it and it looked like it had mutton chop whiskers down the sides of its throat. Today I met a friend Cathy to see if we could spot it again and found that a whole lot of other people with binoculars, cameras and scopes looking for it as well. We all search up and down the spit but to no avail. I found another special bird heading south while we were doing so. It was a Horned Lark but more on that tomorrow. We scoped out all the sparrows on the way back and the Lark Sparrow was not among them. Checking out the parking lot before we got into our cars, Cathy spotted one sparrow that looked a little different and on further inspection… there it was. 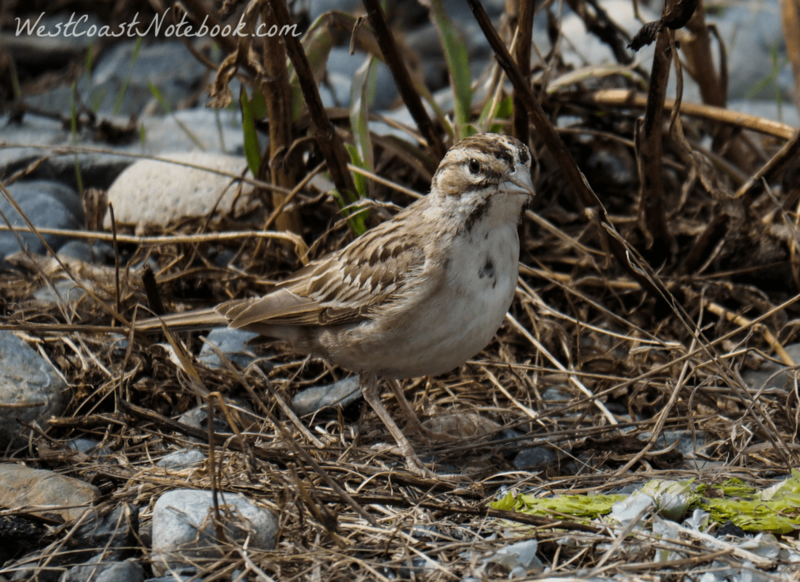 The Lark Sparrow! Here we had spent hours scouring the spit for the bird and it was right in the parking lot all the time. Cathy waved down the other birders that had been searching for it and everyone got a good look at it along with pictures. All in all, it was a good day on the birding front for all concerned. Well actually… any day birding is a good day.